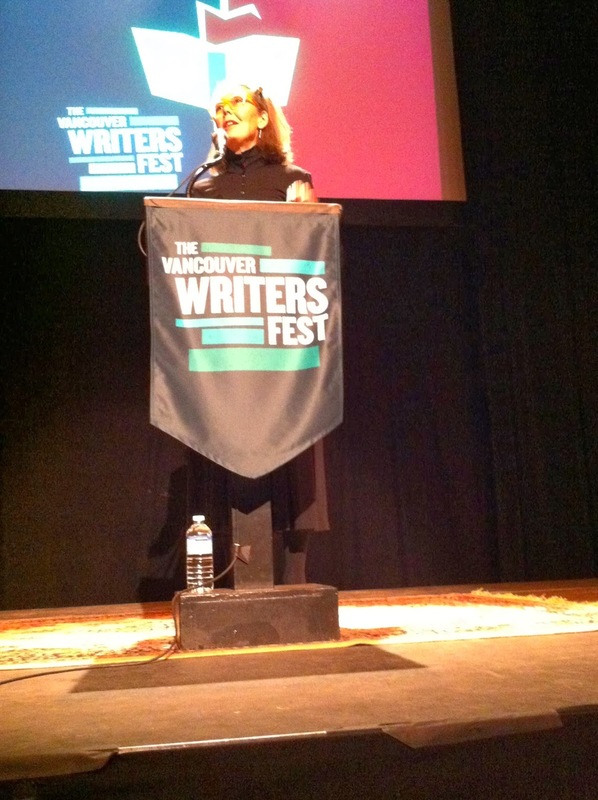 If I attended “An Hour with Anne Carson,” at the Vancouver Writers Festival yesterday. If Aislinn Hunter introduced her, using the unlikely but nifty words “betweenity” (purloined from the Brontës’ letters, she said) and “blacksmithery” (source unclear). If her miked voice had what seemed to me to be intensity in restraint. If Anne Carson said she was glad to be back in Canada if only to get a proper bran muffin. If she then read an essay written in a kitchen in Ontario in winter. If it was called “Merry Christmas from Hegel,” and if it was, post Nox, a meditation on stillness. If she admitted, perhaps untruthfully perhaps not, to not understanding Hegel. If she said she will paraphrase Hegel badly. If the essay described, with what seemed to me to be aching restraint, what she called “snow-standing” amid the stillness of conifers. If the text only mentioned Hegel briefly. If she also described that subtraction as something like, “shadow on shadow in precise velocities,” which might be an image of Hegelian negation. If she said afterward that she wouldn’t be able to answer any questions about Hegel. 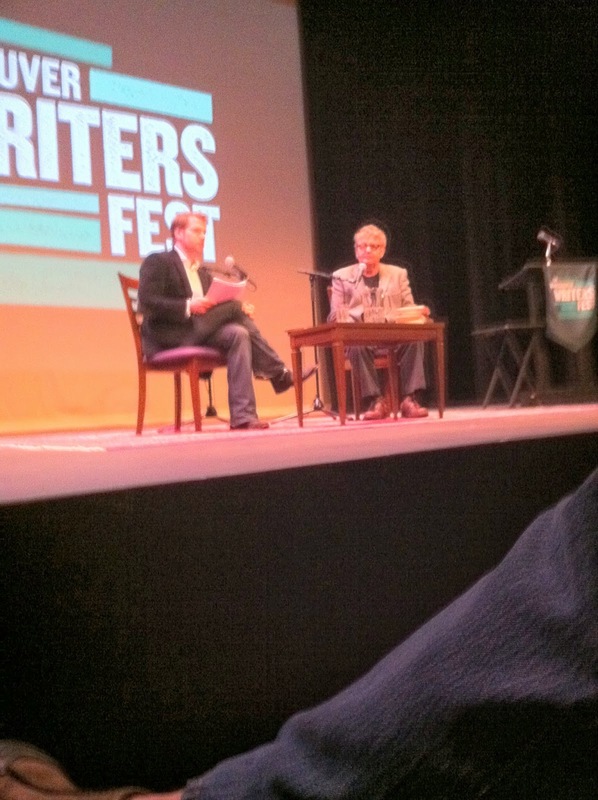 If people applauded because it was a beautiful essay and her reading was very beautiful. If she then read an essay on a painting by Betty Goodwin. If the essay was called “Betty Goodwin Seated Figure with Red Angle,” and if it was written for an issue of Art Forum. If by form she meant her essay not the painting. If she also said that she wanted to find a form or a syntax that suited her own inability to have an opinion about Betty Goodwin’s painting. If she never said, Ut pictura poesis. If I heard in her sense of “opinion” what Plato calls pistis, “belief,” a subordinate form of doxa, “opinion,” but she did not say this, and I may be both pretentious and wrong. If no one believed her when she said this. If it wasn’t intolerable, not at all. If this made me think. If by that she meant Betty Goodwin specifically, but I also took it to mean herself. If everyone applauded again because she was wryly brilliant and provocative. If she went on to read from Autobiography of Red and red doc>. If there was more heartfelt applause. If she took a bow. If people asked her questions. If she took another bow. If I could thank her. 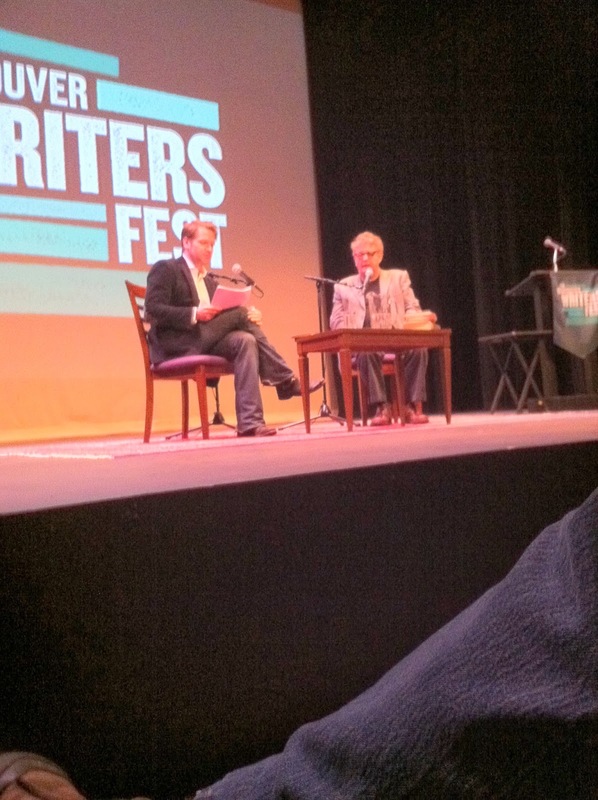 Paul Muldoon was interviewed by John Freeman on stage at the Waterfront Theatre at the Vancouver International Writers Festival this afternoon, and he’ll be reading as one of eight poets at the Poetry Bash tonight at Performance Works on Granville Island. He was asked right off the bat to talk about his collaboration with Warren Zevon, which resulted in a song, “My Ride’s Here,” the title track on Zevon’s last record (and was then covered for a posthumous tribute album by none other than Bruce Springsteen). Mr Muldoon said he “kind of went to school with Warren Zevon,” noting “just how difficult it is to write a song” to make it sound so effortless, and praising Zevon’s genius. He found himself, in composing his lyrics, trying to locate a raw, emotional “angle of entry” into a song. Asked to differentiate between poetry and song, he said: “I suppose at some level the pressure per square inch in that [Muldoon’s lyric, ‘You Say You’re Just Hanging Out . . .’] isn’t quite what it could be in one of the poems.” At the same time, he said how he wants to realize his own desire for directness and clarity, which lyrics can so better “at some level.” He said he was still “struck by Seamus Heaney’s (I think) successful attempts to pick up Yeats’s suggestion that ‘Myself I must remake,'” and also declared that “poems are more evidently (not necessarily more truly) made out of the core of one’s being.” He described the impact of BBC radio on his desire for clarity and “the need to be direct.” At John Freeman’s request, he read “Wind and Tree” from his first collection: “In the way that most of the wind / Happens where there are trees, / Most of the world is centred / About ourselves.” He read from Madoc, noting as well that he was a “big fan of our friend Laurence Sterne” and how he had also derived a “fascination with lists” from Robinson Crusoe, Defoe’s interest in “stuff.” He said he encouraged his students to develop “a sense of the resonances of every word in a poem,” the specificity of language. He read his song-lyric, “Elephant Anthem,” and noted how he used to pore over lyrics printed on lp sleeves. 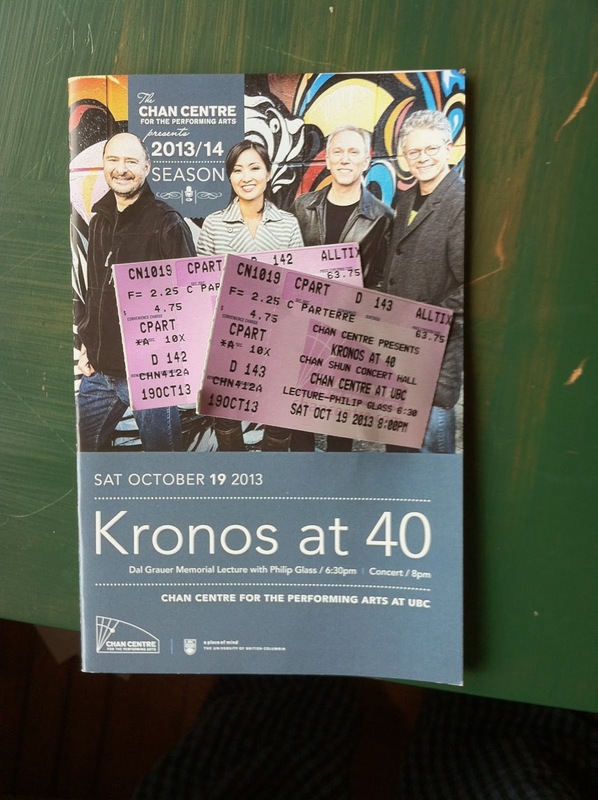 Last night Christina and I attended “Kronos at 40,” a sold-out concert by Kronos Quartet at the Chan Centre at the University of British Columbia celebrating the string quartet’s 40th anniversary as a working unit. The programme, a gathering of contemporary work and commissioned arrangements of folk and roots music, was fairly typical – if anything Kronos does can be said to be typical – of what has become the quartet’s cultural mission: a strong commitment to fostering new, sonically-arresting, cutting-edge composition and to disseminating those often challenging soundscapes to as wide an audience as they can draw. That commitment was powerfully evident last night, for me, in the taut rhythmic virtuosity that each member of the group – David Harrington, Hank Dutt, John Sherba and new cellist Sunny Yang – brought to every piece they played. Whatever a composer’s method, approach, aesthetic, they were on it, utterly and unflinchingly. And after forty years, absolutely nothing about their energy, enthusiasm or dedication to all kinds of new music has diminished. Highlights from last night’s performance included a brief but wonderfully nuanced version of an arrangement by trombonist-improviser-composer Jacob Garchik of a blues by the little-known Geeshie Wiley, “Last Kind Words.” The unresolved subtleties and the powerful timbres of Wiley’s voice that ghost through the song’s surface-noise-laden original recording (from around 1930) are translated by Garchik into gently interlacing dissonances across a palette of strings, with Harrington’s violin taking a kind of vocal lead, weaving in and out of the other lines with a give-and-take that offers a present-day mirroring of the collaborative call and response of traditional African-American form. It worked brilliantly, I thought. 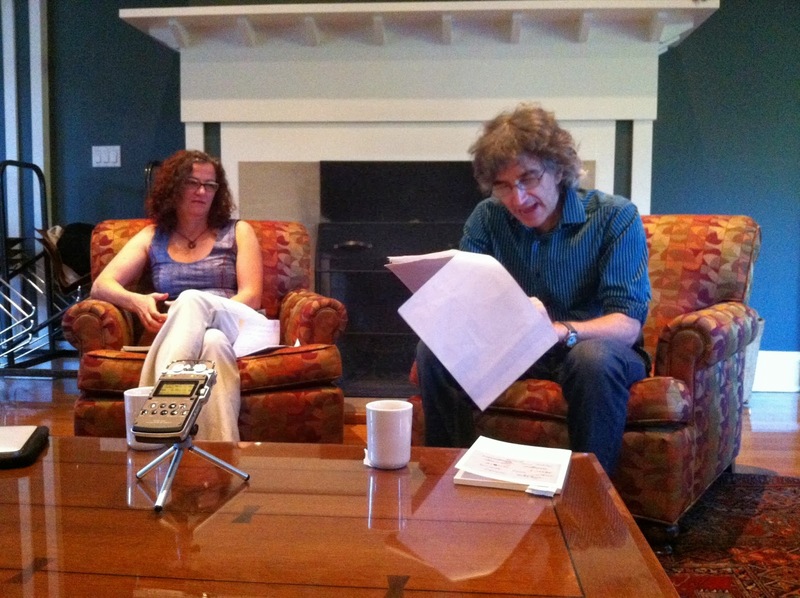 There were fine arrangements, too, of Iranian, Ottoman and Jewish songs, as well as electronically- and instrumentally-augmented compositions by Canadians John Oswald and Nicole Lizée, and by Serbian-born Aleksandra Vrebalov. They played three encores, arrangements of Greek and Columbian melodies and a killer version of what was has been their signature piece, Jimi Hendrix’s “Purple Haze,” complete with light-show and rumbling feedback: they rocked the house, really. His String Quartet No. 6 opened a door into that place. The performance was about half an hour, and consisted of three movements, at tempos (maybe allegro -andante – allegro) creating a kind of envelope or frame that seemed to reflect a classical formalism; Glass mentioned Haydn in his earlier remarks, and there is something of Haydn’s structural symmetry carried forward in Glass’s writing. Glass also referred to the dynamic feel of Bartok, and it’s important to recognize that this sixth quartet also enacts a certain loosening in its textures, particularly around the dynamics; the hurried contrapuntal minimalism of his early work is moderated in this work into waves of surge and release, which Kronos managed brilliantly. In the third movement, I thought I kept hearing echoes of MGM-style film music, but afterward Christina told me she thought those were traces of Aaron Copland’s folk idiom and I think she was right – whether Glass intended these echoes or not, the work communicates a sense of a late Americana that is both moving and engrossing. It was a true privilege to be able to hear this music, and to hear Philip Glass speak. Go back a little more than a year and a half ago, and I hadn’t even heard of The Avett Brothers. My wife had started listening to their music on the recommendation of a friend, and she found something they’d done earlier on for NPR, maybe a Tiny Desk Concert. I’ll have to look this up. Within a few days, and after a few repeat listens, she was definitely hooked, and so was I. We bought and/or downloaded a stack of their albums, and their tunes were on heavy rotation on the stereo. Their sound is obviously based in Carolina roots music and bluegrass; their core instrumentation – to which they strip down in concert, or else around which they build their band – is a trio of banjo, acoustic guitar and upright bass, played by Scott and Seth Avett and Bob Crawford. Joe Kwan’s cello has also added a key texture to their aural palette since the early days of the group’s existence, and when they perform the four of them tend to position themselves in a line across the front of the stage, Seth and Scott at the centre, flanked by the other two. We were given tickets to an Avett Brothers concert in June 2012, when they appeared as a headliner for the TD Vancouver International Jazz Festival. (Their music has little to do with mainstream jazz, apart from a few commons threads in Americana and the blues, but most jazz fest programmers these days rely heavily on non-jazz acts to bouy up revenues and draw in audiences. I actually ended up missing a Wayne Shorter gig to hear their show, but it turned out to be worth it.) We had great seats, a few rows from the stage. From the moment they hit, the energy in the house was through the roof. This was a couple of months, I think, before the release of The Carpenter, and they were testing out some of the more rock-oriented material from that album. It was my first experience of them live, and I have to say that I was unprepared for the exultant, keen and impassioned drive of their performance. They blew us wholly away. In a recent interview in Rolling Stone, Scott, Seth and Bob talked at length about the band’s evolving sound, positioning them amid what Scott calls “the changing form of somewhere between rock and country and folk.” They refer back to a phrase coined by Scott – “young wonderment” – to describe the tenor of many of their lyrics, their music’s message maybe, but “young wonderment” also encapsulates the impact of their performances on an audience. There are certainly moments at an Avett concert of entrancing delicacy, something of “sparkly-eyed” grace and artful “shine” that their songs often both embrace and disparage: it’s what they want to make happen, but they also articulate a suspicion of being taken in by it, seduced by phony glitter and stagecraft. Still, despite the relentless apologies and self-recriminations in those songs – the admissions of failure and loss that seem pervasively to inform their writing – their performances take up a genuinely hopeful and affirmative trajectory. The youthfulness to which Scott refers isn’t a nostalgia for innocence or naïveté but a raggedly passionate energy. On Thursday night, seeing them for a second time at the Orpheum in Vancouver, I could feel the force of their convictions, their belief in what live music could accomplish. They jumped and thrashed, they caressed and kicked, they stroked and stomped. Sometimes rough, sometimes intimate, they drew from their twangling instruments a tangible sense of commitment, of being right here, in the moment, that moment, giving it whatever they could. The wonderment of the Avett Brothers has nothing to do with passive awe or amazement and everything to do with vitality and vigour, a fierce and embodied poetry. One review noted the “joyful buzz” they produced in the audience emerging onto the street after the show had ended. That feeling, that liveliness, the life-force they and their music seems to offer us as a gift, keeps going. Most Canadian readers must be over the moon about Alice Munro, who was awarded the Nobel Prize for Literature last week. 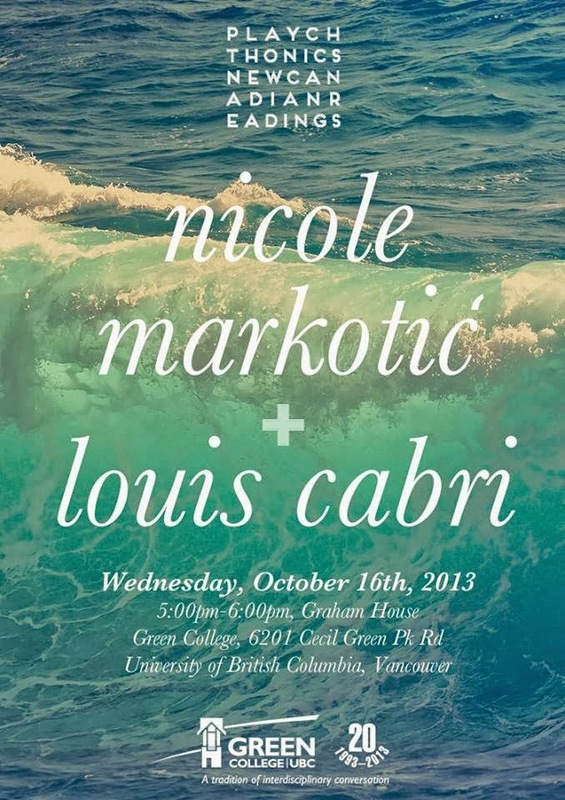 There’s a reactive cultural nationalism, no doubt, around the immediate rediscovery of her work, which was never really lost from view, never really in need to being recovered: Munro remains one of a handful of Canadian writers with a huge international profile. (The most-quoted blurb on Munro’s book jackets has to be from the American Cynthia Ozick, who famously called her “our Chekov”: every time I’ve seen that phrase quoted I have bristled, as I suppose many of Munro’s readers might – quietly, of course, the Anglo-Canadian way: just who is this “our” Ozick was talking about? Despite her long catalogue of stories in The New Yorker, Munro could never be taken for American. If anything, the global enters Munro’s work through the awkward, partial lens of the local, the marginalized mundaneness of small-time Ontario or British Columbia life. Out there remains not quite here; Chekov is somebody you might read at school, and who comes from someplace else, somewhere more sophisticated, smarter, better.) What we tend to recognize, reading Munro, what we take to be “ours,” reflected back at us, is a wry, homegrown acuity – a passing and contingent certainty that these our seemingly unheralded voices might still have something to say, and something worth hearing about. I first encountered Alice Munro’s writing in 1982, during a first-year English Lit survey course at the University of Western Ontario – which turned out, although nobody mentioned this at the time I don’t think, to have been her alma mater, or almost to have been, since she left university to get married in 1951 before finishing her prospective degree either in journalism or (like mine was to be) in English, depending on which sources you read. The course was team-taught by Richard Stingle, Donald Hair and – for one guest lecture – by the poet James Reaney, all of whom were immersed, critically at least, in the work of Northrop Frye; our reading list included Jay MacPherson, slices of Spenser, both King Lear and Twelfth Night, Reaney’s invocation to the muse of satire, The Waste Land, something from John Hollander (“Swan and Shadow”: classic), and a spate of poems and essays. I can’t remember if there was a novel or not. But there was Alice Munro: her first collection of stories, Dance of the Happy Shades, published in 1968. My professors taught her writing as an example of Southwestern Ontario Gothic – the term is James Reaney’s, I think, and wasn’t given to me in that freshman class, but came out of a graduate seminar I took with him some years later. The idea, as Reaney put it, drawing heavily on Munro’s characteristically small-town, domestic mise-en-scène, was that there was something dark and unpleasant creeping under the flowery kitchen linoleum, a version of what Munro herself might come to characterize as the “open secrets” – the bad things everybody knows and no one can admit to knowing – that circulate with muted insistence around WASPish, repressed Canadian communities like her Jubilee, putatively a displaced rendering of Wingham, Ontario. The story to which I gravitated most in Dance of the Happy Shades– it’s a great collection: early work, but in so many ways fully formed, shaped by a spare virtuosity – was the generically named “Images.” It involves narrative set-pieces that will soon become familiar to Munro’s readers: the forbidding marshland physiography anticipates the swampy grave of “The Love of a Good Woman,” and the muskrat trapping – echoing the mink farm of “Boys and Girls” – also prefigures the paternal farm of Lives of Girls and Women. In “Images,” we encounter (through the eyes of a young girl, out with her father) the figure of Joe Phippen, who wields a vaguely-threatening hatchet and lives in the cellar of his burnt-out family home off in the bush outside town. The story is built – as my Frygian professors no doubt insisted it must be – on Jungian archetypes. Joe’s house pretty obviously refigures the chapel perilous, a trope derived from Arthurian quest romance, which as students of T. S. Eliot we had presented to us through Jessie L. Weston’s From Ritual to Romance. Here’s how Munro describes the entrance to his underground burrow: “We came out in a field of dead grass, and took a track across it to another, wider, field where there was something sticking out of the ground” (39). Something: hardly the highfalutin grandiloquence of some latter-day Chanson de Roland. But the resonances and uneasiness build. We had been reading Sir Gawain and the Green Knight, too. “Mind your head here,” says Joe Phippen, the hatchet man, as they descend into his dark space. He’s an Anglo-Ontario clone – the settler-culture, second-hand version – of an English green man, a latter-day Wodwo. Still he could see nothing. He thought it strange. The burn bubbling under as if it boiled. It had a hole in the end, and on each side. Or old gappy rock-heap, it could be either, or neither. We are both made by our stories, and by our refusal to tell them: for Munro, we don’t consist of our globally-shared typologies, or common fairy tales, but by what remains outside of telling, just beyond the dark reach of words. We are alike in our unlikeness. Munro’s sense of place, of belonging in and to a distinctively Anglo-Canadian experience, isn’t a case – as James Reaney might have put it, of re-making the global in the image of the local, but instead of resisting from within its deterministic narrative pressures, of working our way into and through its gappy cracks.